As my fellow CIPR Social Media Panel member Rachel Miller has already ably blogged, Share This Too is due to be published by Wiley at the end of August. My contribution to this edition is a chapter on network topology – the study of the structure of networks. And in a very timely and helpful co-incidence, I’ve just recently gained access to a practical example of network toplogy in action with direct relevance to the world of social media and PR. Many of you will already be familiar with Traackr. 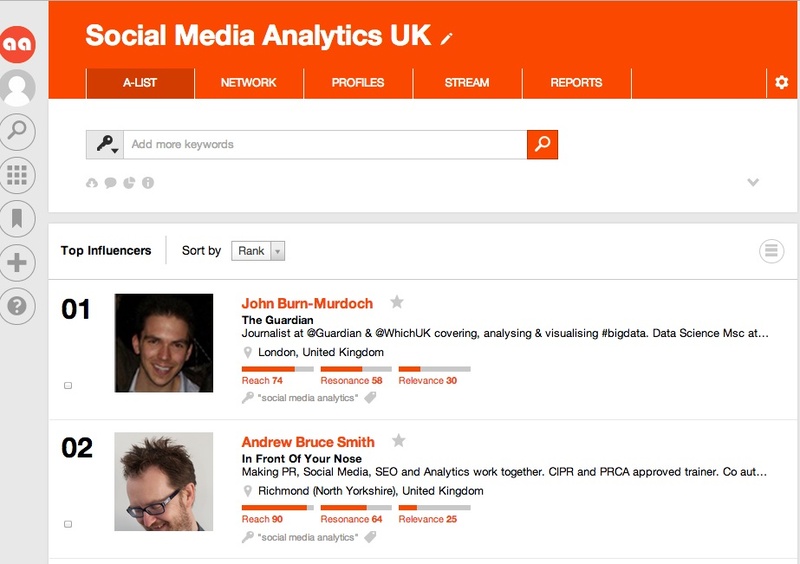 For those who aren’t, it is probably best described as an influencer identification tool. It allows you to easily build lists of key influencers relative to a specific topic or issue by looking at the reach, resonance and relevancy of individuals across all the major social platforms, as well as blogs and media outlets. 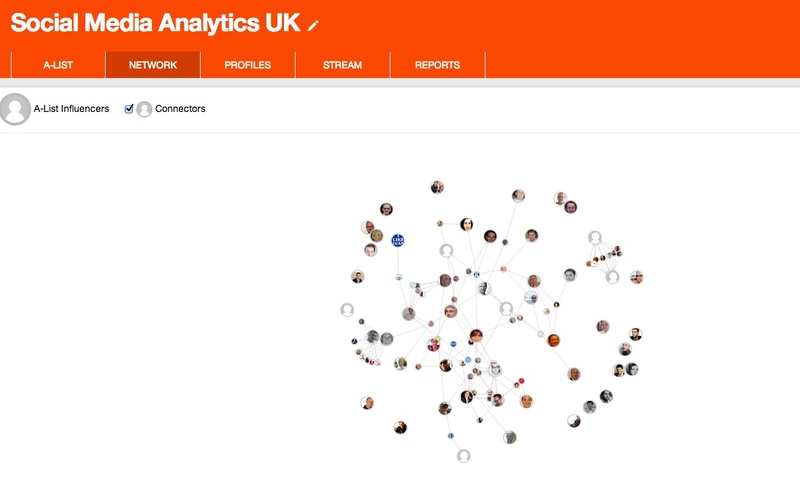 In the last week, Traackr has announced the availability of a new network analysis function. 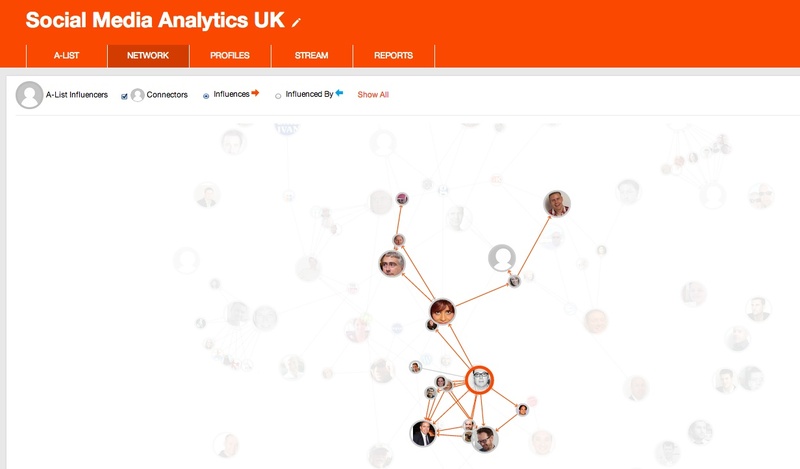 In simple terms, it now allows you to actually visualise the structure of relationships within your list of influencers. It also allows you to see people who aren’t already part of your influence list – and yet should be – based upon their relationships with people who you are already targetting. To provide an example, I’ve created a project in Traackr based around the topic of social media analytics. In order to help Traackr determine who the most relevant influencers might be for your chosen topic, you have to provide a list of keywords that would best match the content and interests of the people you are seeking. The more relevant the keywords you provide, the more accurate the list that Traackr creates. In the case of social media analytics, I’ve used Google’s Keyword Planner tool to generate an initial seed list which I then plug into Traackr. Here’s a screen shot of my initial list as ranked by Traackr (go here for more info as to how Traackr decides who to pick). The larger the circle, the more engaged that person is with others in the list. You can see who influences who (in the sense of which person gets more resonance and engagement from others – and vice versa). Here’s an example based on Euler Partner’s Phil Sheldrake. You can get insight into the structure and influence patterns of any individual on the list. It doesn’t take much to understand how this can have very practical use in PR and social media. By identifying where people sit in the network, you can use this topological information to plan who you should target and how you should target them. Sometimes it might mean going for the people who are most central to the network. Or you might identify people who are important bridges between two sub-groups of influencers. Interesting post, Andrew. I saw the announcement that Traackr had released a development in this area and will follow with interest how it goes as I am a firm believer of the power of this stuff. Also great to hear that you are penning a whole chapter on network topology for Share This Too. Brilliant. How many will “get it” do you reckon?